Orthodontic treatments have come a long way from the traditional brackets and wires of metal braces. 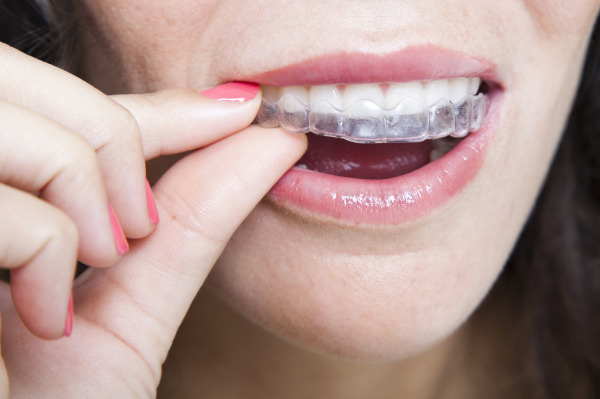 Today, dental patients who are interested in straightening their teeth can do so with clear aligners from Invisalign®. Twelve Bridges Dental is happy to serve as your trusted source for Invisalign® in Roseville with our certified Invisalign® dentist, Dr. Raj Zanzi. Invisalign® uses a series of invisible plastic aligners that snap seamlessly over teeth, and are custom-created for your smile. Week by week, as you receive new aligner trays, you will notice small changes that lead to the ultimate finished product of even, beautiful teeth. Patients who see ideal results from Invisalign® are those who wish to straighten their teeth but want to avoid the high visibility of metal braces, such as business professionals and teens. Invisalign® is also typically used for those who have already worn braces and need minor orthodontic improvements to correct relapsed teeth. The benefits of using Invisalign® extend beyond increased confidence and a more beautiful smile; straighter teeth are easier to clean, so you can decrease your risk for tooth decay while maintaining a metal-free smile. If you’re interested in clear braces to transform your smile, start with a consultation from our certified Invisalign® provider, Dr. Zanzi, to discuss treatment goals. During this appointment, you can share your concerns about your smile and what improvements you would like to see. We can discuss realistic expectations with you, share educational videos, and have you look at patient success stories to help make your decision. Dr. Zanzi uses state-of-the-art diagnostic planning tools when developing your treatment plan --including digital imaging and an intraoral camera -- so patients understand how Invisalign® can help them. After taking molds and images of your teeth and jaw, Dr. Zanzi will send these to the Invisalign® laboratory. A few weeks later, you will return to Twelve Bridges’ dental office to receive your first few sets of clear aligner trays. You will wear the aligners for 22 hours each day. These invisible trays exert a gentle force on your teeth to help move them into the ideal position. You will switch the aligners every two weeks, making check-in appointments in-between to track your progress. Dr. Zanzi has offered Invisalign® for over six years. His experience with this modern orthodontic treatment can help you achieve the straighter teeth you desire, without the visibility of metal braces. Twelve Bridges Dental Group also has an orthodontic specialist on-staff, who is an expert at providing braces for adults and children. If clear braces may not produce ideal results for your unique case, Dr. Sanders is happy to speak to patients about alternatives to Invisalign®. Your Ideal Smile is Waiting! We invite you to schedule an Invisalign® consultation at Twelve Bridges Dental to learn how you can achieve straighter teeth the invisible way. We are proud providers of clear braces in Roseville and nearby areas, including Rockville and Lincoln. My 6 year old had a really great experience with Dr Zanzi, every one in this office is great with kids. When kids are happy and get things done in a professional way, parents are happy too.We received a follow up call on next day from Dr Zanzi to check on how is our son doing. Friendly staff works together to make the experience very smooth and efficient! "My First Experience at 12 Bridges Dental Clinic"
As a new patient I really appreciate how friendly and professional all the staff is.I think I finally found a Dentist and dental staff that I'll enjoy coming back to. I've been to quite a few dentists in my life and I must say that Dr Zanzi and his friendly staff are the most pain free enjoyable dental experience I've had .I feel very lucky to have come across Dr Zanzi.The way Dr Zanzi worked on my teeth showed and felt like he cared about the pain and made it almost non existant.I am very impressed with the work and look of my new teeth.Thank You Twelve Bridges Dental ,you are definately the best dental staff that I feel lucky to have come across! Wow! I can't believe the results!Incredible and well worth it. I will recommend it to evryone.I am sure my friends,clients,colleagues,and Judges will be much more happy to see my smile! Thanks Again.. I found Dr Zanzi very professional & friendly .I totally recommend his service and his staff. I would like to highly recommend Dr Zanzi as being absolutely the best dentist I have ever been to.I have been under his care for over 3 years having many procedures done.I am impressed with his kind and courteous demeanour but more importantly the confidence-inspiring level of expertise which is obvious.He is extremely gentle and efficient.I credit Dr Zanzi with relieving me of a life-long fear of dental work and would follow him wherever he might go. If I had been coming to see Dr Zanzi my entire life instead of just in the last year I would not be "AFRAID" of the dentist office(I am 38).My experience here has been awesome.I have had several teeth worked on and all of these experiences have been positive and painless. I have recommended to my co-workers and family this office and hope they take advantage of the awesome people(including all the dentist assistants and front office people).